A Beauty Affair - A Singapore Beauty & Lifestyle Blog! Beauty Reviews & More In Here! 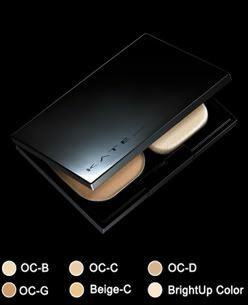 : Kate Cosmetics Bloggers' Event + Mini Giveaway! Kate Cosmetics Bloggers' Event + Mini Giveaway! I hardly dabble with cosmetic because I'm still a noob. I doubt I can blend eyeshadow properly without looking like a clown. So I never knew I could achieve such a look till I tried out the Kate cosmetics at the Kate Bloggers' event! Kao Singapore presents Kate Bloggers' Event. And I'm sure Kate Cosmetics is no stranger to you beauty junkies. Kate is all about breaking free from the usual routine, to just find your own style and dare to be it. This is the motto behind Kate! I have lots to share! This also the first private event for Kate in Singapore. I'm really privileged to be invited and to get to experience Kate in person as I have never used anything from them before. I know their gel eyeliner are all the rage in Singapore but I am a really *LAZY* girl when it comes to eyeliners. So I prefer it in a stick and not in a pot with a... hey, what's the brush? So the party's theme was black with a hint of red but I don't have much red accessories. I just came in all black, the grey cardigan doesn't count because it was essential for hiding unflattering fatty arms. They had Holly as the VJ, yes, this is the Holly who won the MTV VJ Search in 2010! She's really young and very pretty... I think she's eurasian. So envious, she has sharp features and is model skinny. They also flew in their makeup artist, Mr Mikiya Hirai from Japan to do a demo for us. Ok, let's do a quick run-through, step by step on how to create a day look, followed by a night look. I apologize if the steps below are not in proper sequence because I can't really recall exactly. STEP 1:As the model had light makeup on, he blotted away the excess oil with a tissue paper. STEP 2: Mr Mikiya applies the LASTING HIGH COVERAGE POWDER FOUNDATION all over her face. The brows are important because they frame up your face. STEP 4: He then proceeds to do the eye makeup for the model, starting with the eyeshadow. He is using the EYE SHADOW DB in BK-1. STEP 6: Mr Mikiya applies eyeliner using the SUPER SHARP LINER in BK. It's so sharp, it's perfect for drawing the wing tip at the corner of the eye. Note this is not RD-1 but PK-1. However, photo shown for illustration purposes only. This is for the DAY look! And now, for the night look which you can easily achieve before heading down to the pubs after work. STEP 1: Smudge & add on eye shadow for a more dramatic look. STEP 2: Apply eyeliner using the SUPER SHARP LINER in BK. STEP 3: You must try their MAGICAL LONG LASH MASCARA. It really makes your lashes look like falsies, so you can just ditch your falsies! Check out my photos below and you'll understand why. STEP 4: Loose powder time! HIGH COVER UV PRESSED POWDER. This is yet another highly-raved product by Kate. STEP 5: Mr Mikiya uses the lighest shade of their foundation as a highlighter. He sweeps alittle off below the inner corner of the eyes down in a V-shape, avoiding the apples of the cheeks. Dusts the nose bridge, the top of the T-zone area and then dabbing a litte at the chin area. For contouring, he uses the darkest foundation shade and dusts it lightly across the inner side of the jaws. STEP 5: Lip color is applied, a lighter foundation shade is used to contour the lips area to give it a more pouty look. This can be achieved using a cotton bud to swipe some of the foundation off and applying it around the entire outer lining of the lips. Next, dust a little hint of silver on the area just at the tip of the lips to complete the whole pouty look. And ta-daaa! This is the finished look! Now, things get even more interesting as we get to dabble and play around with all these KATE cosmetics to re-create our own look. I'm still quite a noob with makeup so this was indeed an experience for me. I get a little help from Mr Mikiya in applying the eye shadow. VJ Holly tries out the colored eyebrow mascara. I had a smashing good time at the party, I even got to know a new friend, Patricia of SweetestSins.Blogspot! Now, let me share what I like most after trying out their products. The WHITE EYELINER PENCIL is LOVE! It's to be used along the lower waterline area and it is slightly shimmery. Big loves for this product as it really helps to widen the eyes. This is perfect for re-creating the Japanese Gyaru look! My next love is their mascaras! They have one for volume and another for length. You must use the mascara base before applying because they give you these dolly, long lashes which are also great for the Japanese Gyaru look. I love my makeup look! What do you think? Check them out! I totally adore my lashes !! 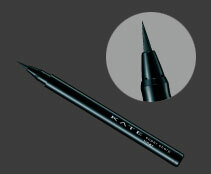 Win for yourself a KATE EYE SHADOW DB IN GN-2. LIKE MY FACEBOOK PAGE! CLICK HERE!